In a time of tightened budgets, nobody underestimates the challenges local authorities face in delivering against competing but equally important public health targets and priorities. We hope that through the breadth of Health Matters tobacco content we have made the economic case for tobacco control, but a question may remain; what tools and resources are available to support professionals make a local impact? 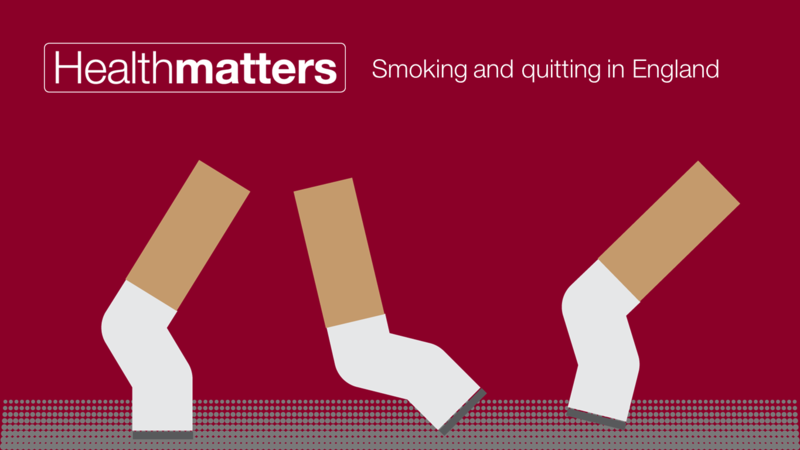 PHE’s Local Tobacco Control Profiles for England provide a snapshot of tobacco use, tobacco related harm, and measures being taken to reduce this harm at a local level. 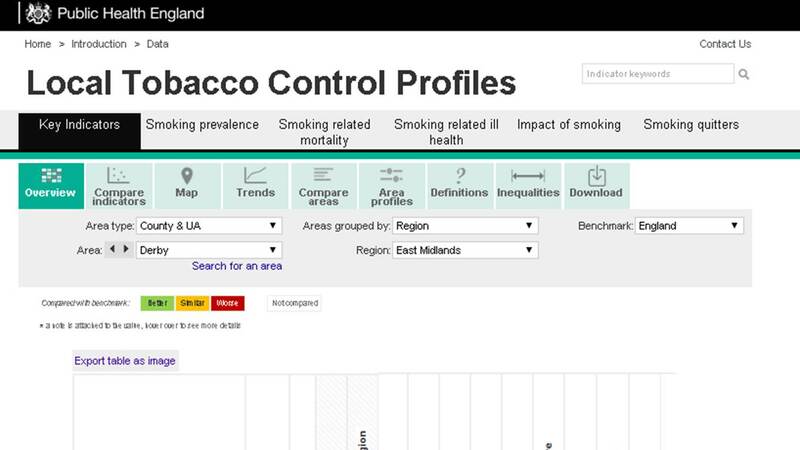 The profiles have been designed to help assess the impact of tobacco use within local populations, informing commissioning and planning decisions. Existing data is updated and new indicators are added regularly. The tool currently has around a thousand users a month and the majority of these come from local authorities. Users tell us that they get data from the profiles to feed into their Joint Strategic Needs Assessments (JSNAs) and to help make the case for tobacco control work. We publish a Joint Strategic Needs Assessment Support Pack to help local partners inform the JSNA process and to commission comprehensive tobacco control interventions. The resource contains a series of good practice evidence-based prompts and key data. The CLeaR self-assessment tool is an evidence based improvement model which helps local authorities to review their current efforts and develop further action to reduce smoking prevalence. Training is available from PHE to help you make the best use of this tool and you may also be interested a Health Matters CLeaR case study, profiling work in Durham County Council. 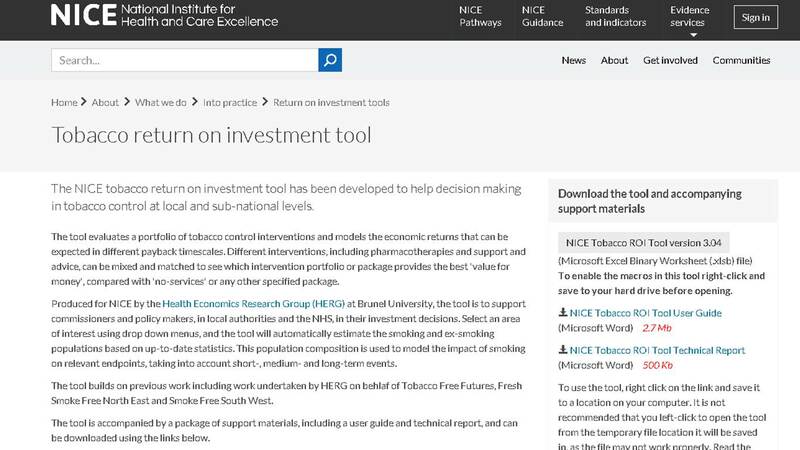 We recommend use of the NICE tobacco return on investment tool, which evaluates a variety of tobacco control interventions and models the economic returns that can be expected from each. Different interventions can be mixed and matched to see which package provides the best value for money and ROI. I’d particularly like to flag two resources that can help you brief councillors and other stakeholders. A number of organisations have come together to create the ASH Local Toolkit for tobacco control. This provides a set of materials to help ensure that tackling tobacco use is high on the local public health agenda. We hope you might also use PHE’s ‘Comprehensive local tobacco control: why invest?’ downloadable slideset. GBD Compare is a new online tool that for the first time enables you to rank the burden of disease for 306 conditions from 1990-2013 by region and deprivation, along with the relative impact of 79 different risk factors. As the tool is new we’ve published a detailed blog explaining its capability.